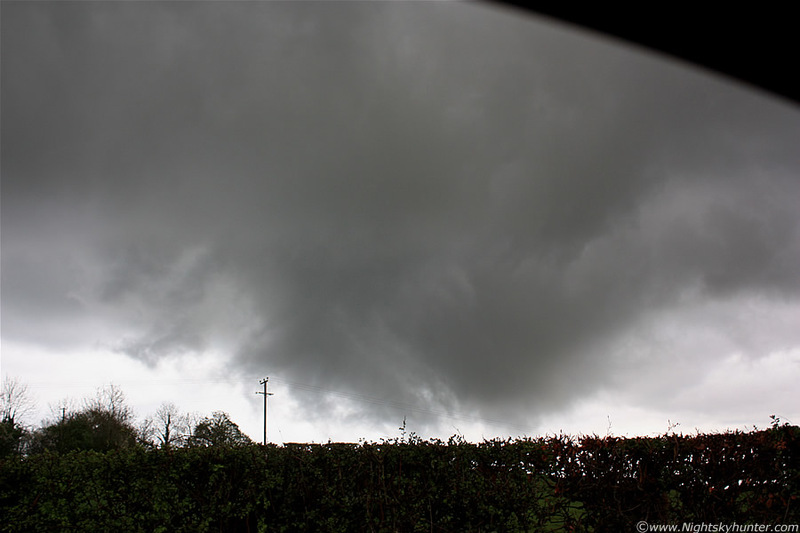 At this point it was just one huge mess of swirling dark clouds with separate areas of spin, and I was about to loose sight of it soon behind that hedge. I decided to move position, I pulled out from the road side and drove around a tight bend onto a narrow flat road on level ground, I looked up through my windscreen and was amazed to see a huge black funnel at close range spinning through the air directly in front of me, I went into a state of panic because I wanted to get an image of it, however at the same time I had to watch the road because I could end up in the ditch at any moment, I tend to be distracted from driving at the best of times when there's convection in the sky, but when you have a big fat funnel rotating out the window in front of you at phenomenal speed...well...that's just ridiculous!. Just as I was savoring that amazing view my windscreen suddenly misted over and I was completely blind, no funnel or road visible, I turned the fans on frantically, stopped the car, and put down the window just to make sure I was still on the narrow road, then drove on hoping to find a spot to pull over. Small clear holes appeared at the bottom of the window near the fans so I used these to scan the road in front of me, this was so nuts because it had to happen then of all times. I crossed a junction and quickly pulled over on the LHS. I had parked so that the driver's side window was facing E, then I leaned out and began snapping. 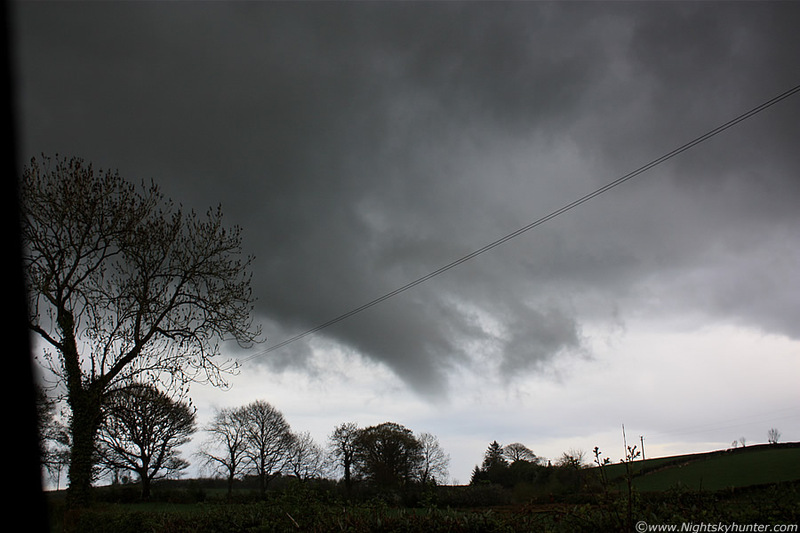 This is a 24mm shot of that huge rotating funnel, this was VERY big visually and rotating so fast that it was dragging large sections of cloud and scud through the air around the tube. This was so unreal because I was parked at this exact same location three days earlier watching small updraught towers in the distance while hunting for cold air funnels, and now there was a massive one with tornadic speed doing it's business straight in front of me. The length of the funnel extends all the way up and to the L behind that tall tree, it was moving to the L and away from me. It really doesn't get much closer than this. 42mm zoom into the funnel, so much for image stabilization (IS) lol, I guess they are not built to handle the kind of camera shake associated with proper adrenalin pumping action, I know when I look back on this that I was in a very excited state, however I never thought I was so bad that it caused those trees to blur. I got a call from Conor who asked for my position, I informed him and he was on his way so I waited for him here. I was very much looking forward to the RV. I got out from the car and began walking along the hedgerow snapping images, click click click, while walking side ways, almost in combat fashion, as if the camera were a gun...click, click, click. I was getting that used to this event that I was eventually able to calm down, stopped shooting for a while, and just watched and studied what was happening in the sky. A few cars passed behind me and I was more than tempted to wave them to a stop and point at the tornadic action, they must have been switched off because none of them seemed to be aware of what was going on above them - typical. The above scene was amazing, and a sight I shall never forget. 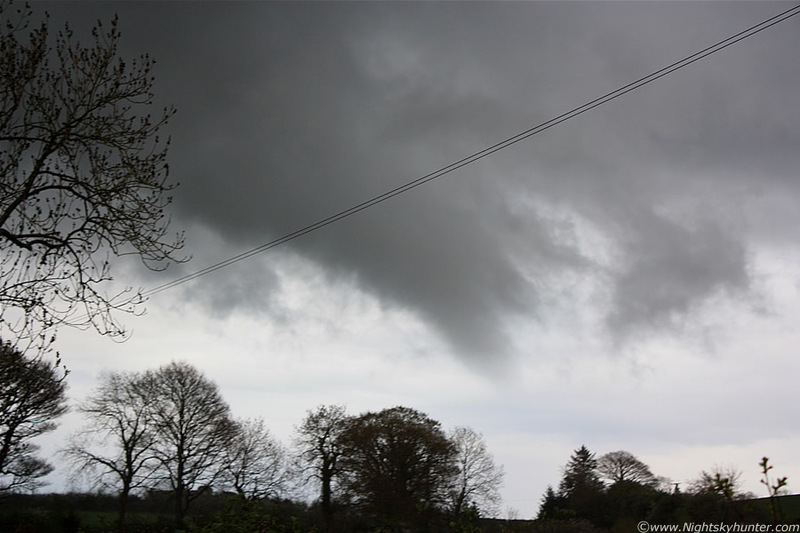 There where three main areas of incredible rotation happening simultaneously, above the trees is the rear of that large funnel which was spinning away with cloud caught around the snout like seaweed around the blades of a propeller, that funnel was beginning to lift higher off the ground like a US tornadic funnel about to rope-out. In the distance, behind those trees at centre, was another tornadic vortex, this one was not well defined and looked more messy and ragged however this didn't make it look less spectacular, in fact, far from it. That region boasted a tangled mess of scud fingers which could be seen rising upwards from near ground level and into the clouds, this motion was incredible and described a vertical and horizontal spin, there where even multiple vortices in that region evident by the many tendrils of scud. Another area of rapid rotation was visible outside the frame to the LHS. So I was standing there watching those three amazing areas of rotation, the big funnel was slowing down it's spin and began to weaken so I took this zoom shot of the other vortex, this was the kind of event which images can't do justice to, and once again I cursed myself for not having the video camera, had I brought it along I could have set it on the car roof and let it record while I took still images. The area of interest above was a large vortex of very high rotation speed with a multitude of long streaks of scud which could be seen rotating and lifting in crazy motions, it's very difficult to describe these though. I could see cloud lifting up from behind those distant bushes and shooting skyward with twisting motions, between 4 and 6 of these could be seen doing this at the same time as the entire entity rotated. Considering that an observer does not have to see the condensation funnel (s) on the ground for it to be a tornado, I was entirely convinced that the bottom of the vortex was indeed on the ground. 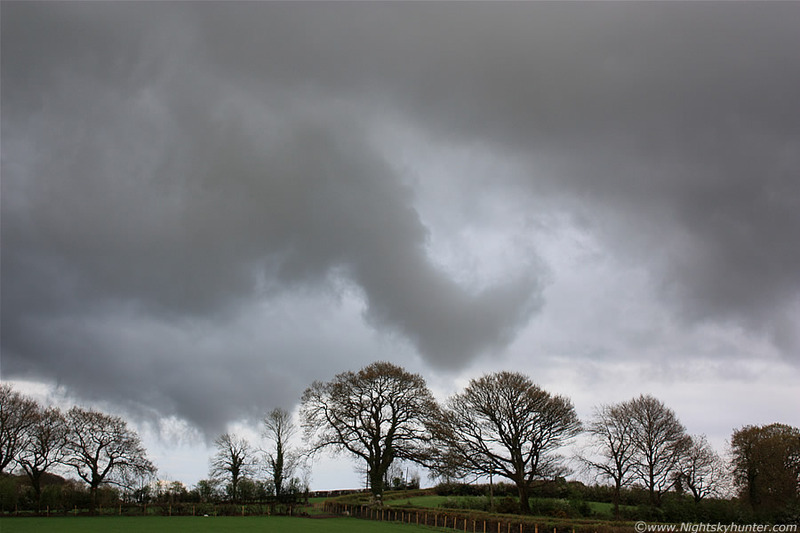 The other area was still rotating in the E, although the big funnel had gone. More cars passed me, slowed down for a nosy at what that weirdo with the camera was so engrossed in, then drove on. I kept scanning the road wondering where Conor was. A little later looking at the rear of the cell as it moved to the L and away from me, you can see the large precip core on the LHS with the inflow region to the R where all three vortices had been active. Two of the areas had died out at this time leaving the spinning scud to the far R which also weakened, the show was just about over. The cell had that cold messy look at that time and had become outflow dominant. The Sun was now breaking out from the gaps in the cloud behind me and the Birds were singing as the environment returned to normality. A bright light caught the corner of my eye, it was the sunlight reflecting off the window of Conor's car which had just crested a large hill nearby to the S, he made is way down and pulled over, I could already see the smile on his face, we met and punched our fists in the air with extreme satisfaction and shouted ''yessssss'' extremely loud. The drivers within the cars which passed us must have wondered why two people could look so happy. With an excited tone both of us began swapping stories and exchanging cameras to check out each other's images, we were on an absolute high, this was the most spectacular convective weather event we had ever experienced in N. Ireland in our entire lives!. We were almost in shock as we retold our individual stories of the event which we had independently witnessed from two different locations, anyone listening in would have known that we had just seen something exceptional. Conor told me his chase story as he rushed along those country roads in Lavey avoiding tractors and other obstacles as that cell rotated straight in front of him, he said he got excellent video footage of the rotation but when we tried to find it there was nothing on the screen except for the still images, it was obvious the footage hadn't saved to the card, this was not strange since the video had hardly been used before on the Canon 500D, which had only just been bought recently, so that was a feature which hadn't been studied in detail, it was a pity but it didn't matter to us, the video footage within our own minds can never be erased. This was one of those magical moments which will stay with us forever, I will never forget us standing there in the late evening light absolutely buzzing with excitement on that country road side watching that disappearing cell and absorbing what we had just shared together - a multi vortex funnel/tornadic event outside our very own town, it was surreal beyond words and almost felt like we where in Tornado Alley in the US. Behind us to the W was another line of tall convection with numerous towers over the Sperrins all back-lit by the low Sun, I could have stood frozen in this moment of time forever. After a long chat we decided to head home and report the event online, so we parted company and home we went. I was going to take Drew out to the forest first because he needed to get a walk and I needed to calm down but I changed the plan in the last min because I was just too excited and couldn't concentrate on the road so I drove straight home instead in the interests of safety. I got home and checked the sat images and radar hoping to find something which would back up what just happened. The Met Office radar was low resolution however it did show moderate echoes with an enhanced pink region in our approximate area. I downloaded my images onto the computer and noticed that I had taken over 70 stills, the time stamp on these was from 19.21 to 19.46 BST, this doesn't include the visual sighting before and after the images were taken so the true period of time was over 25 min's in duration - that's a very long time to be seeing violent rotation like that!. Paul Martin, another chaser from NI, kindly sent me over a series of high res radar images covering this time period which looked very interesting showing two cells interacting at close range, the rear cell appearing to back build and intensify with radar echoes peaking at the top of the scale, the lead cell at 19.20 appears to have some kind of bowing segment or hook which could indicate rotation, however this hook was not the conventional kind so things were not clear cut with this case. Two days later (Sat) I managed to visit the same location again and re-live the event exactly as it happened at the time, I scanned the area for signs of damage however nothing obvious could be seen, this was not surprising since the target area was mostly over flat fields with a few trees and hedges. The entire region over the E slope of the Sperrin Mountains would also need to be checked but that task would be huge considering the amount of ground which needed to be covered.
'' Just had a look at the radar imagery - around 1900 BST, a new cell developed very rapidly just to the NW of Maghera, probably on the outflow boundary of a larger convective mass further to the west. This cell soon became quite intense, apparently back building across the Maghera area while the whole thing expanded eastwards (developing in tandem with the original cluster of cells to the NW). A fairly interesting radar echo persisted until nearly 2000 BST as the cell slowly pulled away to the east. Perhaps the back building behavior of the cell was enhanced by outflow from the cell immediately to the N and the gradient wind which is more westerly or SW'ly. 0-6km was probably around 35 kts, but 0-1km shear on the face of it does not look very impressive. I guess the high ground to the west could have a role to play in localised wind patterns ''.
'' I have run a WRF-ARW simulation initialised with the 12Z GFS run. Domains are nested down 9-3-1km. Spin-up time is rather short but, nevertheless, convection develops in about the right area around the right time. Attached is a snapshot at 1810 UTC showing model terrain-black contours every 50m, 10m Relative Vertical Vorticity-shaded (10^-6 s^-1) and 10m flow vectors every other grid point. Approx location of Maghera is indicated by the cross hairs. The output is best viewed in animation (below). As convection develops over the Sperrins outflow moves southwards channeled by the mountains to the west and high ground to the east. This collides with the environmental flow from the SW resulting in a gust front and band of enhanced low level vertical vorticity. To the NE there is a 'blob' of substantial enhanced vertical vorticity- this begins life as a vorticity feature over high ground to the NW and appears to be picked up by the outflow front before growing and colliding with the high ground to the east. Nb the 1km grid will likely underestimate the absolute magnitude of these vorticity features. Therefore the model suggests that the observations of rotating updraughts are likely explained by interaction of a gust front with the environmental flow. Also it appears that a more substantial terrain induced eddy can form in this situation. 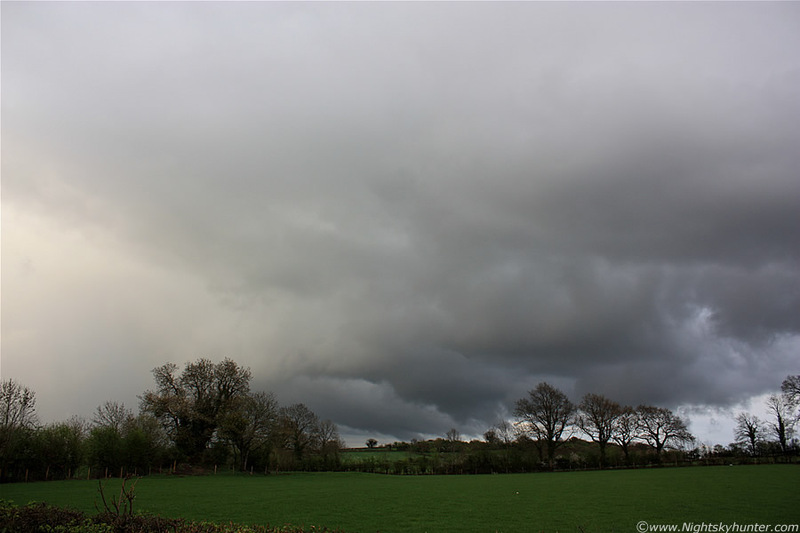 Given the moist environment this could be manifest as a rotating cloud close to the ground. This example of a situation where, although the storm environment is 'benign', interaction of downdraughts with local terrain and the environmental flow can promote the formation of brief eddy or tornado-like circulations ''. This is the animated simulation from David which provides some support for what we saw on the day, note that the animation produced multiple vortices which backs up the visual scene from the ground. It's interesting to note that the computer puts several of these vortices on the ground also. We will never know for certain what caused the events on this day, however it does underscore the importance of regular visual observation of the sky every day and night because one never knows what's going to happen next, nature truly is unpredictable and spectacular in equal measure. This is really turning into a very strange year, and I wonder, what's going to happen next?, whatever it is I plan on being there to catch it on camera!. Thanks for reading.
'' I always think that observation takes precedence over theory. That is how we expand our understanding. All models are simplifications of a very complex reality and few things in life fit the simplified models. As a result observations may challenge our understanding of the world around us. What you certainly saw and experienced was more than one violent, rotating vortex associated with the same storm cell. They may not have looked as if they were straight from the textbook, but few things in the natural world are like that. The upper air sounding used in the discussion was made from Valentia. Its lack of suitable upper air conditions favouring vorticity and possible tornado development appears to have influenced many. I can understand why this sounding was selected - Valentia is in Ireland. However, if we think synoptically and geographically, I would suggest that this was not the appropriate sounding to look for clues. That was at Albermarle in NE England! It is closer to Maghera geographically. Also, it had a much more similar synoptic chronology over those hours than did Valentia. For example, its position in respect to the low pressure centre was much more similar than Valentia and the troughs shown on the synoptic chart were travelling from NI onwards across N England. Obviously there would be some time delay. So, If you look at the 00Z sounding at Albermarle for 30 April you get a very different picture indeed. Very significant speed and directional shear, albeit in a low CAPE environment (very normal for the majority of our tornadoes in any case) - all this at a relatively low level, up to 500 hPA. 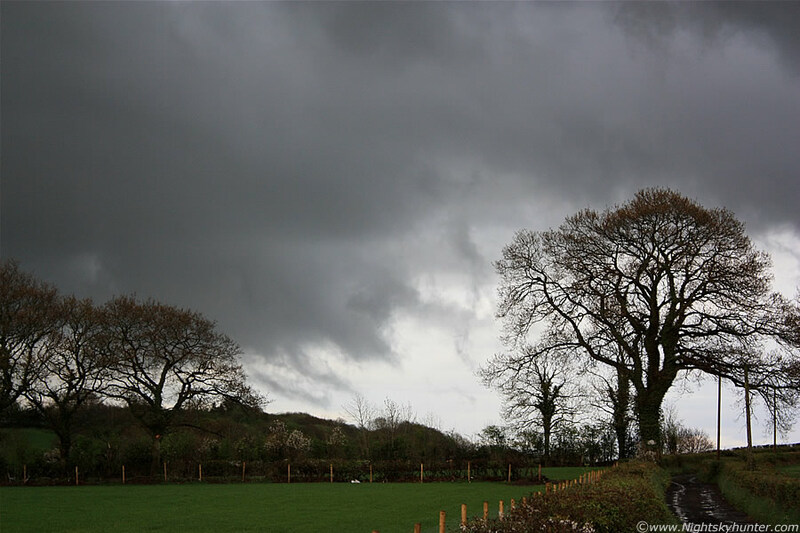 That's a pretty typical context in which tornadoes occur in Ireland. With regard to damage on the ground, it may be worth reflecting on the fact that the size of the vortex does not automatically match the severity and extent of any damage. Tornadoes with large dimensions can be relatively weak as far as wind speeds are concerned and the damage caused may be quite difficult to trace, especially after a period of time has elapsed. If the tornado intensity had been the equivalent to T0 or T1, it would have been difficult to pick out in the open countryside. The fact that you did not find any damage does not mean that the circulation was not on the ground surface for some period of the vortice's life span ''.